The Old Testament reading for Morning Prayer today comes from the book of Ezekiel, the “dry bones” story that we heard just a few nights ago during the Great Vigil of Easter. Ezekiel is led in a vision to a valley full of bones, and God tells him to prophesy to the bones. Bones come together, sinews knit them up, flesh covers them, but there is no breath in them. God commands again, and breath enters the bodies, “and they lived, and stood on their feet, a vast multitude” (Ezekiel 37:10). God ends by saying “And you shall know that I am the Lord, when I open your graves, and bring you up from your graves, O my people. I will put my spirit within you, and you shall live, and I will place you on your own soil; then you shall know that I, The Lord, have spoken and will act, says the Lord” (37:14). 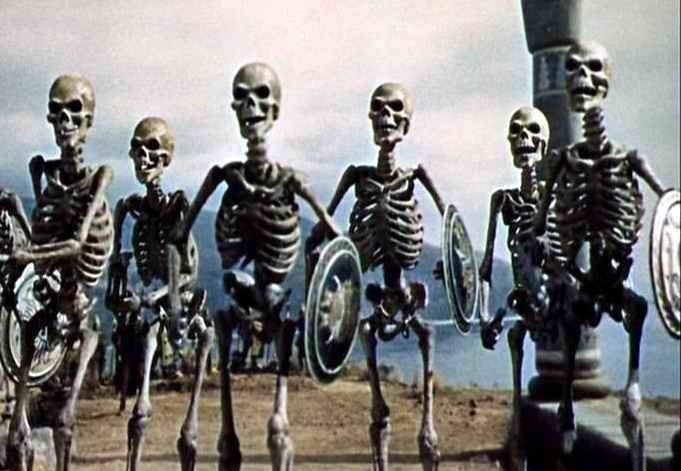 I couldn’t help thinking of the skeleton warriors from the movie Jason and the Argonauts, created so memorably by Ray Harryhausen in early stop-motion animation. However, these fighting skeletons are not the living people of Ezekiel’s vision. We call it the “dry bones” story, but it’s really the “reborn people” story. That’s why it’s part of our Easter Vigil readings each year. It seems to me that too many of us get stuck halfway — we are dried up, but we can at least move and fight and defend ourselves, and we are terrible to each other. However, we are called to more, much more. Through the gift of God’s Spirit, we can live as reborn people, not just as dry bones. This entry was posted in Daily Office and tagged Easter, Ezekiel, Morning Prayer, Spirit on April 4, 2013 by Rodger Patience.